Pugs like to eat. So, it’s really important to make sure that yours is eating the right thing. They need the right food to keep their potential allergies, skin irritation, weight gain, and digestive health on track. To help you find the best dog food for Pugs, we researched some of the bestselling products and put together our Pug dog food review. Before we get to it, let’s look at important features you need to know when shopping. Food Type: Most of the foods we chose are dry kibbles, which should be suitably shaped for a Pug. Small and easy to chew. That said, we did find a wet dog food that brought a lot to the table, too. Dog Age: Puppies have different nutritional requirements than adult dogs. Think about it: they grow so fast, they need a little something extra! So, we made sure to include a few foods just for them along with the best adult foods. 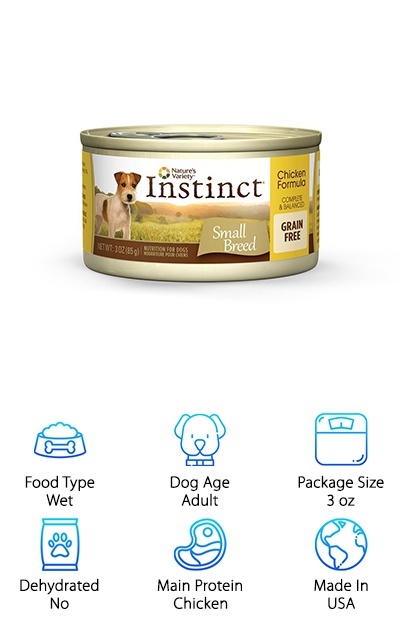 Package Size: Pugs are small so they don’t need the volume of food that, say, a Great Dane would. If you have a picky Pug, start with a smaller size so you know if she’s going to like it. Dehydrated: Dehydrated foods are meant to be mixed with water before they’re served. They’re usually made with fresh, whole ingredients that are dehydrated using special techniques. Dehydrated foods are great, but we went with non-dehydrated ones for our best list. Main Protein: Proteins vary from lamb to chicken to beef! Plenty to choose from. A word about meat meals - they’re not bad! They’re just a condensed, nutrient-packed form of real meat. By-product meals, though, should be avoided. Made In: All of the foods we chose for our reviews were made in the USA. Sometimes special ingredients are sourced from elsewhere, but it’s worth mentioning that none of these options have any ingredients that came from China. Like we said, Pugs like to eat. Feed them right. Now that you have a better idea of what your Pug needs and what to look for when choosing the right food, let’s get to our reviews. If you’re in a hurry, make sure you check out the top pick and budget pick first to get a better idea of what’s out there. Then, you’ll find the top products that round out our list. All right, let’s get to it! Holistic Select has focused on using the best natural ingredients for over 10 years. We think it’s a safe bet to call this our top pick dog food for Pugs. One thing about Pugs is they eat fast and have some digestive issues which isn’t really a great combination. This food helps by having a unique blend of pre and probiotics, natural fibers, digestive enzymes, and botanicals. The main protein in this one is lamb and you can be sure there are no meat by-products, gluten, or any artificial colors, flavors, or fillers. A healthy digestive system makes sure your Pug absorbs all the necessary nutrients, vitamins, and minerals he needs to stay healthy. That’s why Holistic Select places such an emphasis on making sure your pet’s digestive health stays on track. 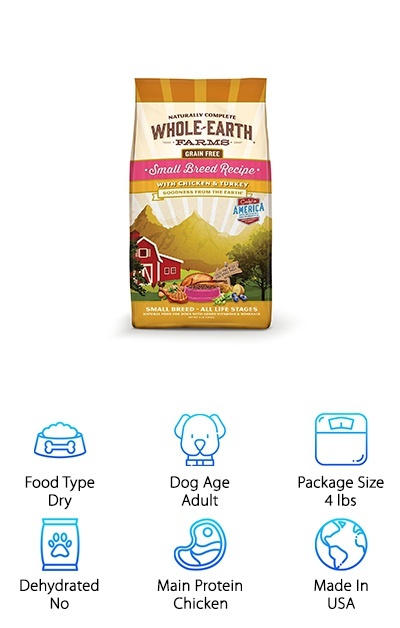 If you want the best food for Pugs that will fit into your budget, look no further than Whole Earth Small Breed Recipe. It’s all natural goodness at a great value. This food supports the unique digestive needs of your Pug. The kibble is even the perfect size for smaller mouths. But that’s not all. Because Pugs are prone to having allergies and skin problems, this Pug food also doesn’t contain many of the most common allergens. No corn, no wheat, no soy. Oh, and no by-products, artificial colors or preservatives. And the taste? Well, dogs love it. Because it’s grain free, it’s great for sensitive stomachs. You can be sure your Pug is getting all the vitamins and minerals he needs from a natural dog food proudly made in the USA. Royal Canin is known for their breed specific formulas and works with vets and breeders to develop them. They say if they make a breed specific formula, it’s because the breed needs it. So, this Pug specific recipe is perfect for your little furry friend. Pugs are prone to skin issues from allergies. Plus, the same wrinkles that make them so adorable can also cause irritation. Because of their size and shape, weight gain is an issue, too. Especially because they love to eat! That’s why this food contains complex nutrients for skin health and the right amount of protein to help with muscle tone and keep an ideal body weight. It’s even shaped for a Pug’s mouth! It’s small and clover shaped which makes it easier for your Pug to pick up and chew. 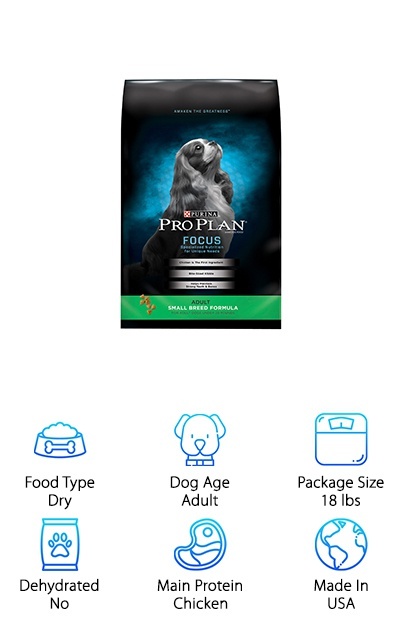 Every ingredient in Purina Focus dog food for small breeds is chosen for a specific purpose. Real chicken is the very first ingredient. It also helps your Pug with digestion because it uses natural prebiotic fibers. Calcium and phosphorus are added for strong bones and teeth. Vitamin A and omega-6 fatty acids are included, too, to keep their skin healthy and coats shiny. This also helps them if they have itchy skin. The kibble is small enough so your Pug can pick it up and chew it comfortably. It’s also nutrient dense so they get everything they need in a small volume of food. This food provides them with a well-rounded diet so they stay at a healthy weight, too. One more thing. There aren’t any artificial colors, flavors, or preservatives. 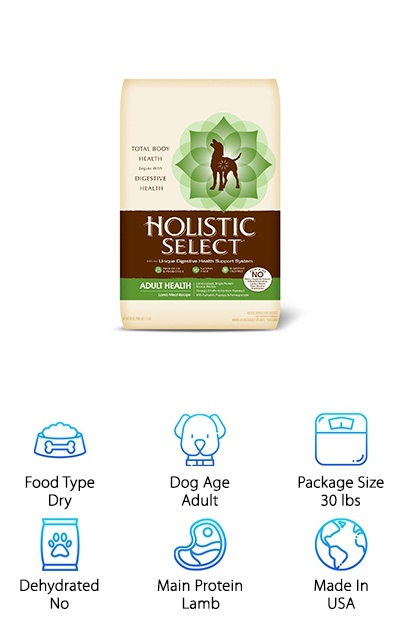 Nature’s Variety formulates their recipes to resemble the food in your dog’s ancestral diet. What does that mean? It’s high in protein and free of grains and gluten. This small breed formula is balanced perfectly to give your Pug the right amount of nutrients in the perfect amount of food. It’s made up of 95% meat proteins - in this case, chicken and liver. The remaining 5% comes from vegetables in order to make it well-rounded and provide your Pug with all the vitamins and minerals she needs. There’s more. Omega-3 and 6 fatty acids promote healthy skin and a shiny coat, perfect if your Pug has skin problems. There’s no artificial colors, flavors, or preservatives. This grain-free, gluten-free food also has no wheat, soy, or fillers. It’s truly tailored to a Pug’s needs. 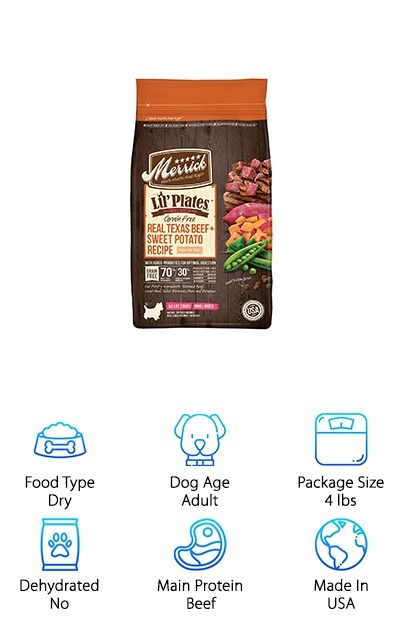 Merrick’s Lil Plates line is specially designed for small breeds. It’s designed to be easily digestible and in the perfect sized portions for little dogs to get all the necessary nutrition they need. The first ingredient in this Pug dog food is real deboned beef. This one is poultry-free, grain-free, and gluten-free. There’s also no grains, corn, or soy. But enough about what’s not in it. What’s in it other than beef? Farm-fresh apples, sweet potatoes, and blueberries provide powerful antioxidants and the vitamins your Pug needs. There’s also peas, sweet potatoes, and more real foods. Probiotics and prebiotic fiber are there, too, to help with digestion. That’s not all. High doses of glucosamine and chondroitin help joint health so your little fur baby can stay active and maintain a healthy weight. Pug puppies have all the dietary needs of Pugs and then some. Think about it. They can double or even triple their size in 6 months! 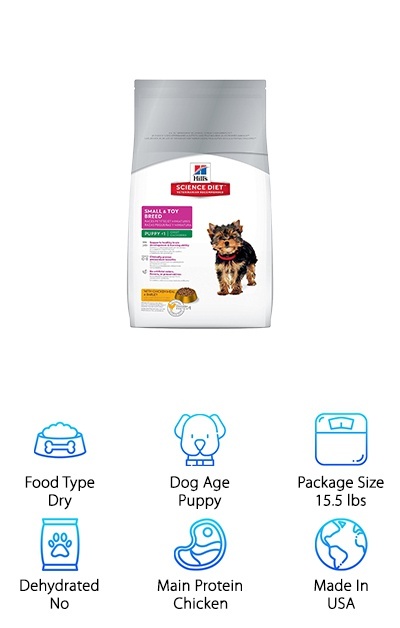 Puppy foods take a little bit more care to develop, especially for small breeds. 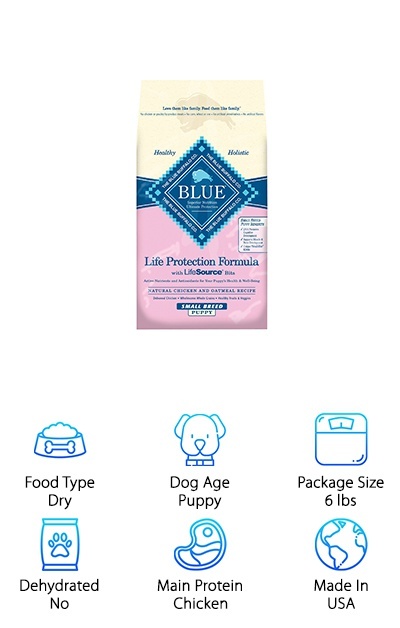 This puppy food from Blue Buffalo was formulated with this in mind. The mix of chicken protein and oatmeal is designed to give instant energy while providing longer acting fuel to help them get through all of their growth spurts. 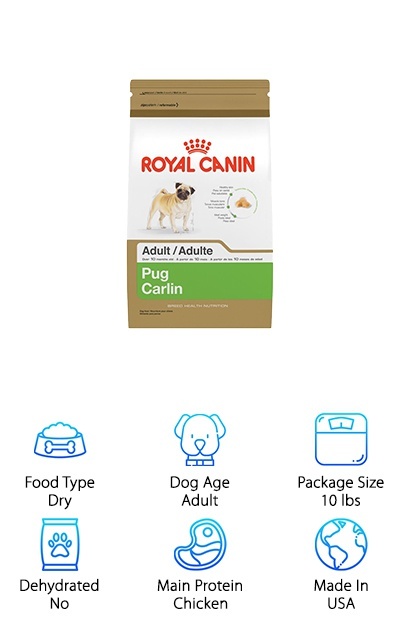 You’ll also find whole grains, garden veggies, and fruits for the fiber, vitamins, and minerals your Pug needs to stay healthy and grow up strong. Specifically, calcium and phosphorous to help with bone maintenance and growth as well as omega-3 and 6 fatty acids for a healthy coat and skin. 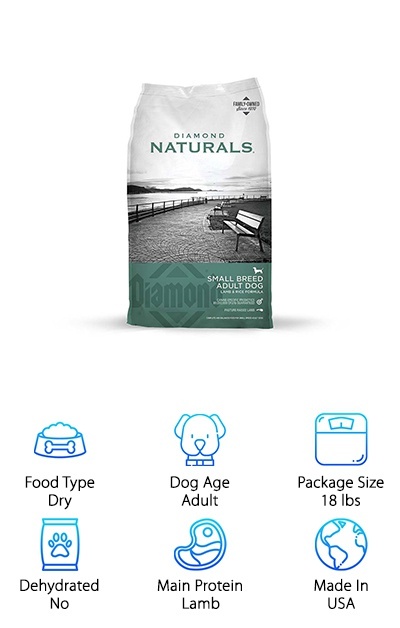 Lamb is the first ingredient in this small breed recipe from Diamond Naturals for an excellent source of tasty protein. But that’s not all that’s packed into these small pieces of kibble. This antioxidant-rich formula gives your Pug exactly what he needs to thrive. The 25% protein/15% fat formula is the perfect mix for a Pug. In addition to being the perfect size for a Pug’s small mouth, the kibble also helps reduce plaque. Fruits and vegetables like kale, blueberries, carrots, and papaya are added for the vitamins, minerals, and nutrients to round out your dog’s diet. And don’t worry about his skin and coat. There are plenty of balanced omega fatty acids to keep them nice and healthy. One more thing. It includes L-Carnitine, a metabolism booster for weight maintenance. When it comes to puppy food, an important ingredient is DHA. Why is it important? It’s necessary for brain and eye development. This recipe has DHA that’s sourced from high-quality fish oils. One reason that this one is particularly good for Pug puppies is that it’s made of high-quality ingredients that are easy to digest. Perfect for sensitive tummies. The proteins are great for lean muscle development and the energy puppies need to fuel their growth spurts. This blend also has plenty of antioxidants, high-quality fibers, and fatty acids. The benefits your pup gets include good digestive health, a strong immune system, a shiny coat, and healthy skin. It’s great for Pugs who are pregnant or nursing, too! One more thing: there’s no artificial flavors, preservatives, or colors, either. 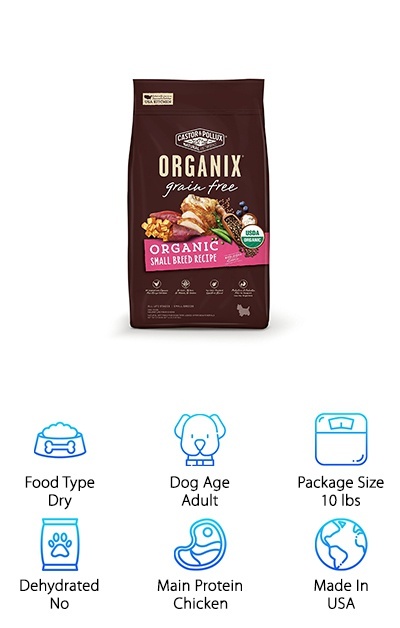 Castor & Pollux are an industry leader when it comes to organic dog food and believes that good nutrition starts with the best ingredients you can find. And get this: it’s made in the USA in an organically certified kitchen. Organic, free-range chicken is the first ingredient followed by organic chicken meal, sweet potatoes, chick peas, peas, and even tapioca. Plus, they use a superfood blend that includes flaxseed, blueberries, and coconut oil. Your Pug will also get the digestive support he needs from prebiotic fiber and probiotics. The size and shape of this kibble are designed for a Pug’s small mouth, making it easier for him to pick up and chew. It’s grain free and there aren’t any chemical pesticides, synthetic fertilizers, artificial preservatives, added growth hormones or antibiotics to worry about.